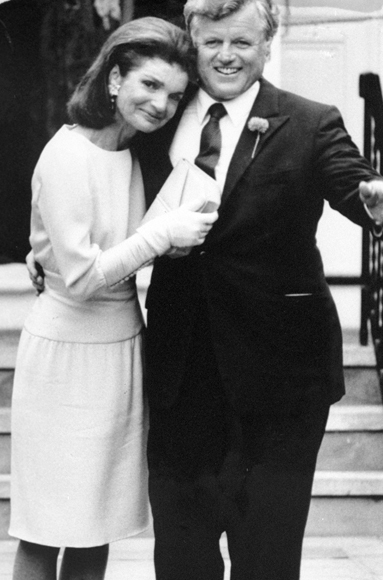 Today's Caroline Kennedy's wedding aniversary. It hit me that Jackie's dress was pitch perfect. It subtly complimented Caroline's wedding gown without overshadowing it. And it was witty without appearing so. What do I mean? Caroline's dress is embroidered with shamrocks as a nod to her father and the Kennedy Irish heritage. Jackie wore a green cocktail dress. She could have chosen any colour, but instead she went along with the theme without appearing costumey (like those dreadful bridemaids' dresses). I'm also coming to the conclusion that my favorite Jackie looks are nobody else's because I looked in vain for pics of the dress she wore at Caroline's wedding...and could only find 2 (one in this topic, the other on google). And neither showed the full dress. Wow, wild roses, you're right. After reading your post I wanted to see the dress again and there are no good photos. Thanks for finding that! The other two shots I found were focused in on Jackie's face--so one could only see the shoulder's and waist of the gown. Even though that pic isn't in colour, it does show the full length of the dress (and it's such a classic shot too!). I know, I could only find these photos in black and white. This dress is a beautiful color. Thanks for bringing my attention the these dresses! I've been mostly familiar with Jackie's 60s and 70s fashion; she was just as fabulous through the 80s. I'm glad she wore neutral shoes, if they were the same color as the dress I think it would have been too matchy-matchy. I read that Jackie had two facelifts in her lifetime. I have to say whoever her surgeon was did a stellar job. She never looked fake. Did anyone watch the special last night on abc (Jacqueline Kennedy In Her Own Words)? I did. I liked it, and I plan on buying the book. I applaud Caroline for releasing it unedited though. (Which I think had more to do with the backlash for the previous "Jackie is so perfect in every way" books she's had a hand in, rather than because she actually wanted us to see JKO warts and all.) And for wanting to restore Jackie's place in the administration. I'm really happy with all the new Jackie books we've gotten this year. I have the new book with the audio recordings and I have to say that the recordings are absolutely fantastic, especially if you are fascinated by Jackie and want insight into who she really was. I have read every book about her, including William Manchester's Death of a President, but I have to say that listening to the recordings (6 hours worth!) is what I always wished for before she died--to hear her talk and reveal who she really was. Of course this recording was in 1964 and is about her life with JFK. But still it is a window into Jackie that despite all the books I've read, reveals so much more about her. You can just hear the intelligence, class, and insight. It is so generous of Caroline to release the tapes now. Also, on a fashion note, there are great pictures of Jackie dressed to perfection during the White House years. I recorded the show on my DVR but it got erased. Urgh. I really wanted to see it. Were there lots of new images of Jackie on there? Had the public ever heard of her speaking before these audio recordings were released? Many times. The most famous example being the televised tour of the restored White House in 1962. Also, when JFK was running for president, she gave speeches at rallys. During the White House years, she was basically tasked with giving the multilingual speeches when the First Family was abroad doing dimplomatic business. And, in 1964, she recorded a short thank you that was broadcast on television where she thanked the public for supporting her during her difficult time. Not to mention, her whispery voice was so famous during the White House years that it was even parodied in songs or by comedians.